The Swiss Family Carlson goes to St. Gallen! 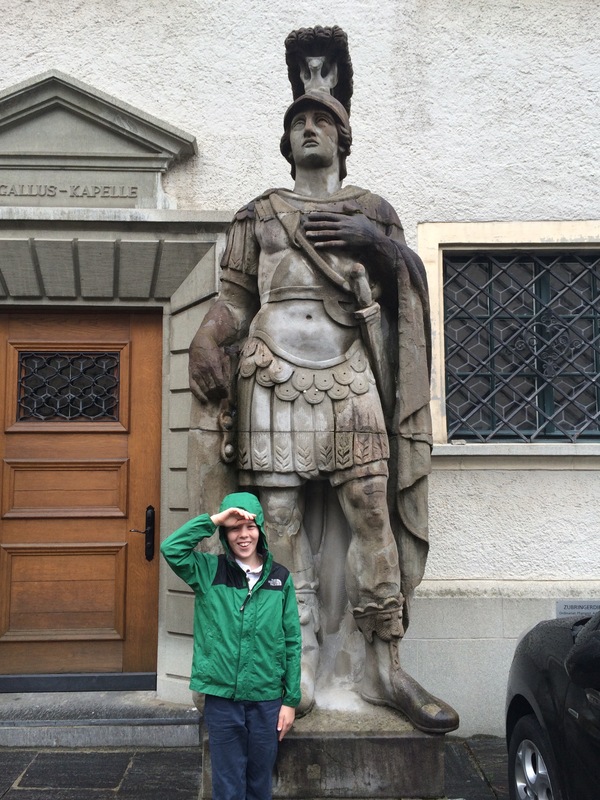 Book-ending our day trip to Liechtenstein was a casual tour of St. Gallen. The Chocolaterie. The most important building in town. 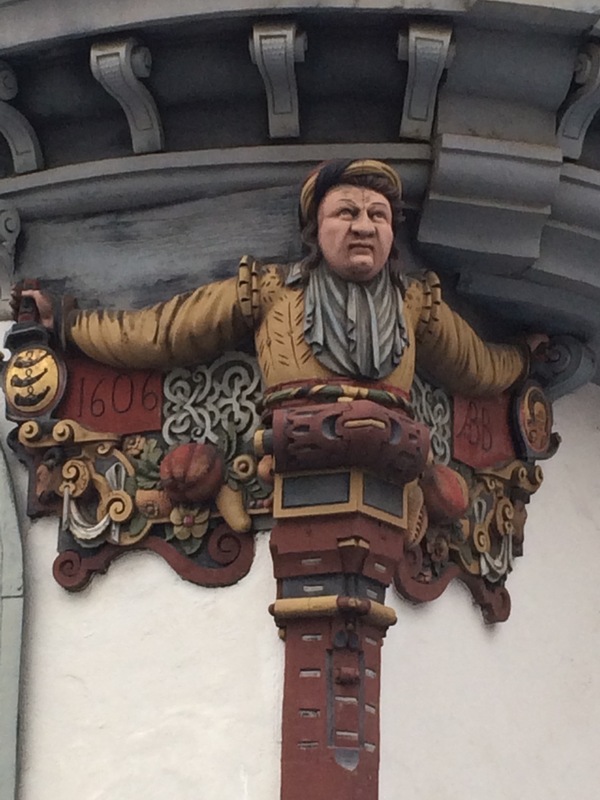 This guy has been hanging around since 1606! 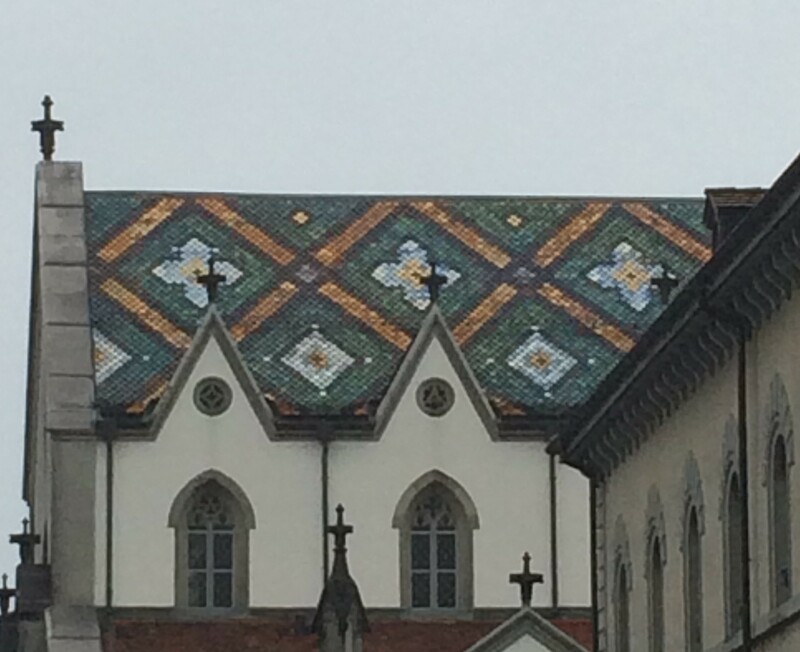 Gorgeous glazed tile roofing. Common around Switzerland and lower parts of France, but always appreciated. A regular window outside some person’s house that features carvings representing the four corners of the known world: Europe, Asia, Africa, and America. The animals, the people, and the things in the background of the carvings are all things found on those continents. The fountain outside the train station. Each Canton even speaks a slightly different dialect of Swiss German just to prove they are different/unique/superior to the other Cantons. And St. Gallen is no exception. Their official language is Swiss German, but they speak a particular Alemannic dialect, making communication extremely fun. 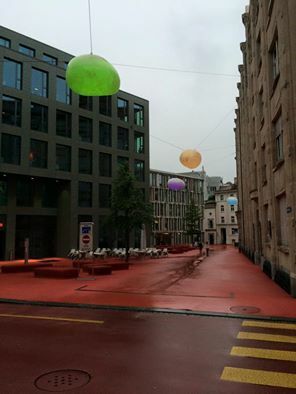 St. Gallen has found other ways of being unique and setting themselves apart. They have amazing art installations throughout the city. The Stadtlounge area of St. Gallen. Blocks of the main city covered with that spongy playground material. The kids absolutely loved it! Even the street is red! And there are these awesome globes above the street! They change color as you watch; from green to blue to purple to gold and back to green. We were lucky enough to find a pizza place right near here so we could watch them flow through their colors. As you can see from this small sample, St. Gallen is a fun city to just wander around and see really interesting and wonderful things. 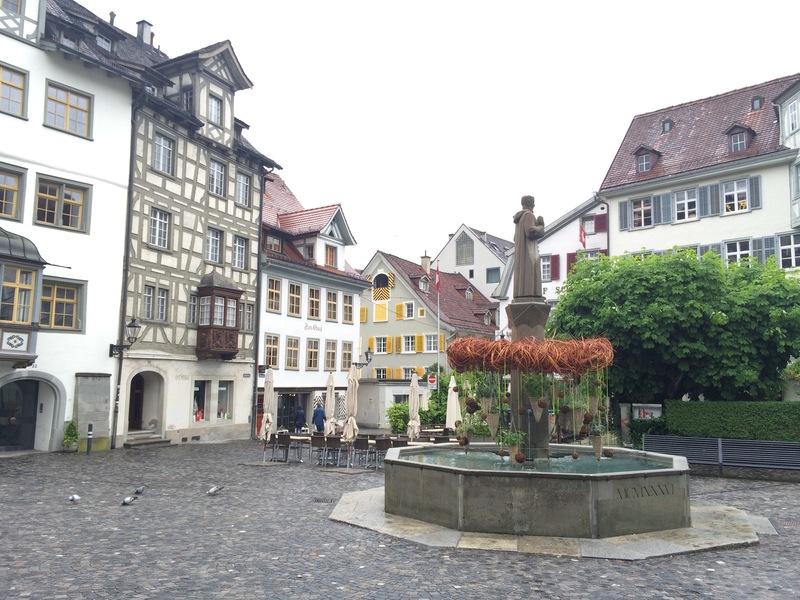 By this point in the trip the boys were rejecting typical Appenzell food and were demanding pizza and pasta. Mark and I still managed to eat fondue one night. E even joined us! I guess a boy can only eat pizza three day in a row before he wants something else. Way back when we visited Dublin (stay with me, here) our tour guide to Newgrange told us that about 800 years ago the Irish sent out missionaries to Switzerland and they ended up settling in St. Gall, which became St. Gallen. And that was part of the reason why we decided to stay there. 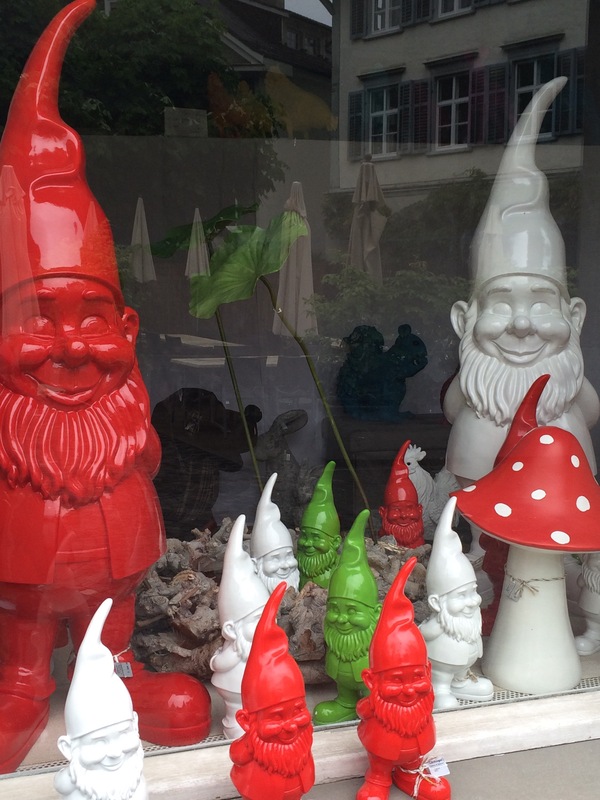 The St. Gallen/Appenzell region sure loves their gnomes. It makes me wonder if the Irish missionaries brought their legends of Leprechauns over with them and they transformed into Swiss Gnomes. Another reason we decided to go was peer pressure. 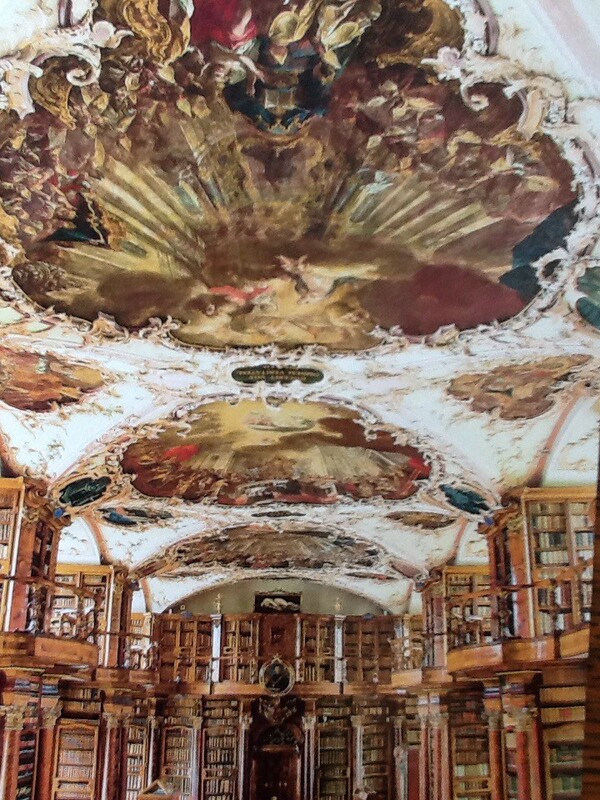 Every time we told someone we were in Switzerland they would rave at us about the library in St. Gallen. The architecture! The mood! The style! The incredible books! All of it! You must go! As some of you know, I have librarian genes in my blood (thanks, Mom), and therefore feel compelled to visit libraries everywhere anyway. So, basically Mark was doomed to have to visit this library with me from the start. 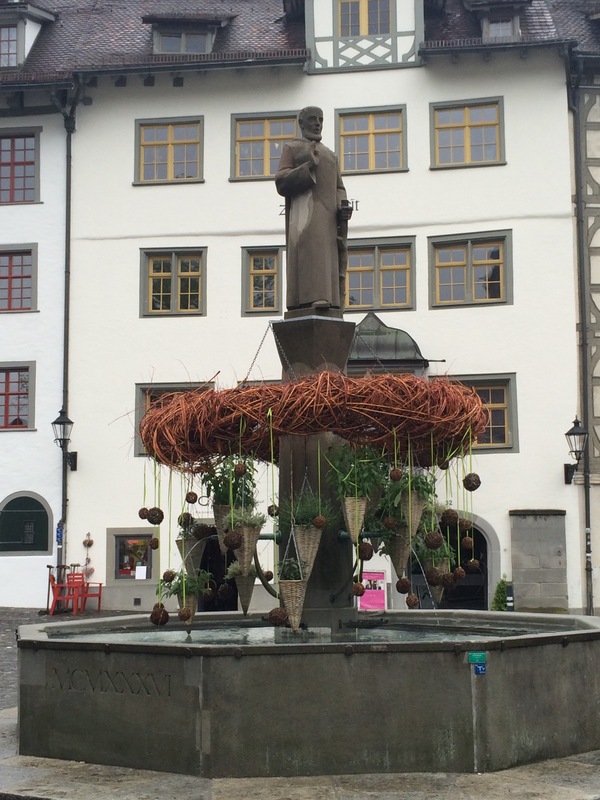 St. Gall on his wonderfully decorated fountain. 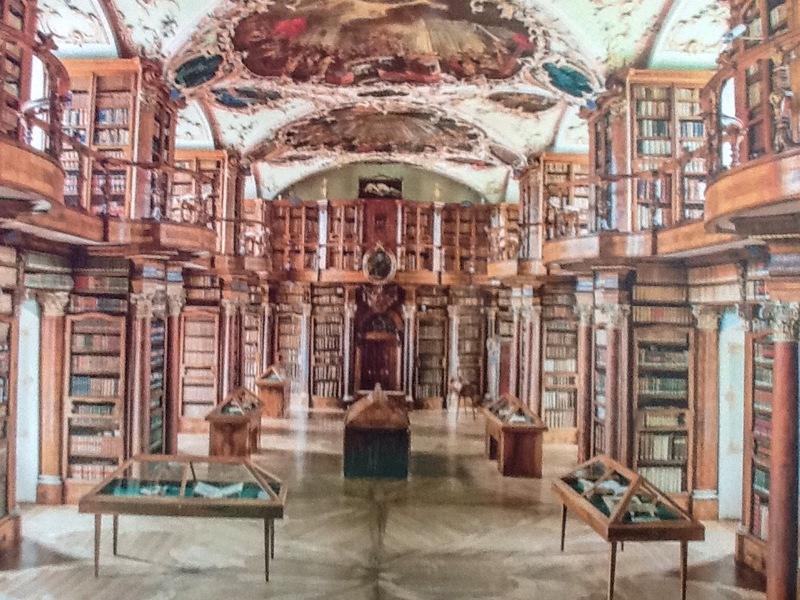 The official name is the Abbey Library of St. Gall Abbey. The abbey and its library were founded by Saint Othmar in 719AD. 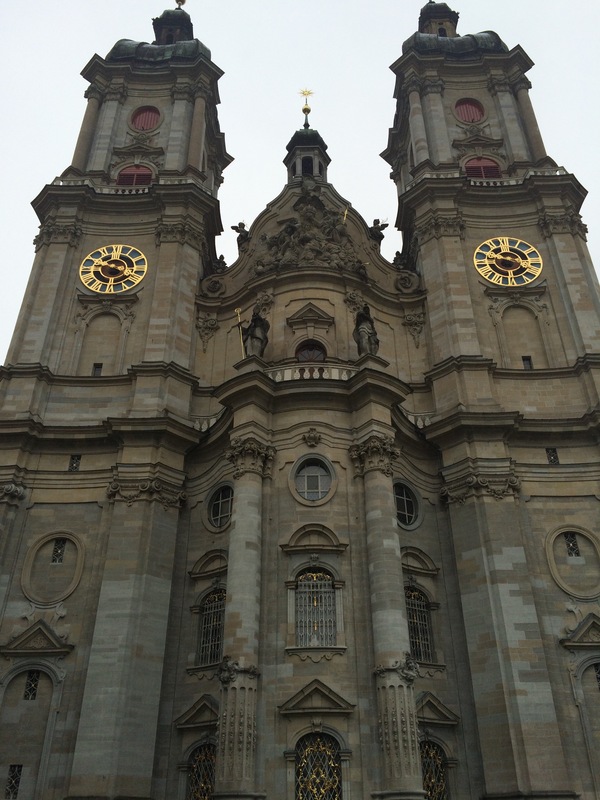 He chose the spot where St. Gall had built his hermitage and named it after him. Now, here’s where we find the Irish in Switzerland. Saint Gall (or Gallen as he is now known) was one of 12 companions of Saint Columbanus during his mission from Ireland to Europe in 589AD. A lot of the paintings and sculptures of St. Gall show him with or standing on a bear. I find that wonderfully symbolic of his religious successes in Switzerland as the the bear is a common theme in Swiss Canton flags and art. 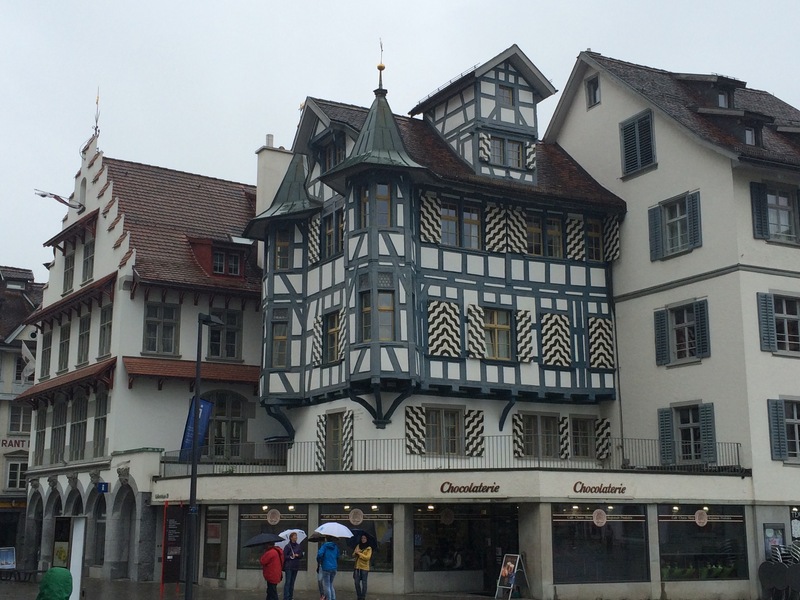 The city dates its founding back to the establishment of the abbey, but it was officially called the town of St. Gall (and not the Abbey) in about 974 when the town wall was completed. In fact, the entire city was controlled by the monks and abbot until the 15th century when the city, and the ruling cloth weavers guild, were granted Imperial Free City status. (There is an entire economics and political science thesis in there somewhere.) It joined the Swiss Confederacy in 1451 and became a Canton of the Federation. To enter the library you had to put on large felt slippers over your street shoes in order to preserve the ornate wood floor. We were also not allowed to take photos so these are images of a few post cards we purchased. You can find over 500 images of the medieval manuscripts of St. Gall at their website. The archivists and librarians do a wonderful job of curating the manuscripts. All the cases you see in the pictures allow the visitors to see many of the medieval manuscripts, including the carved ivory tablets that had been presented to Charlemagne. The ceilings are a masterpiece. I was wandering around in the glory of the library, watching to make sure the boys didn’t attempt to open the cases and actually read the books, (there was a horrible moment when I saw H sitting in a chair drawing in a book that thankfully proved to be the visitor’s sign-in register) when I almost literally stumbled into a mummy. And honest-to-God Egyptian mummy from the 25th dynasty! We left the library after about an hour of just looking around this one 20×50 foot room and started wandering around the church grounds. The abbey and church grounds are actually a huge chunk of the old city, really displaying how much influence the church had in the city and in Switzerland. The monks are watching you! We even found some Roman influence. Outside the old city St. Gallen felt very modern and very much like a gritty, industrial city. Our hotel was comfortable and the walk was short, but the historic architecture stopped right outside the old town and modern buildings and art took over. 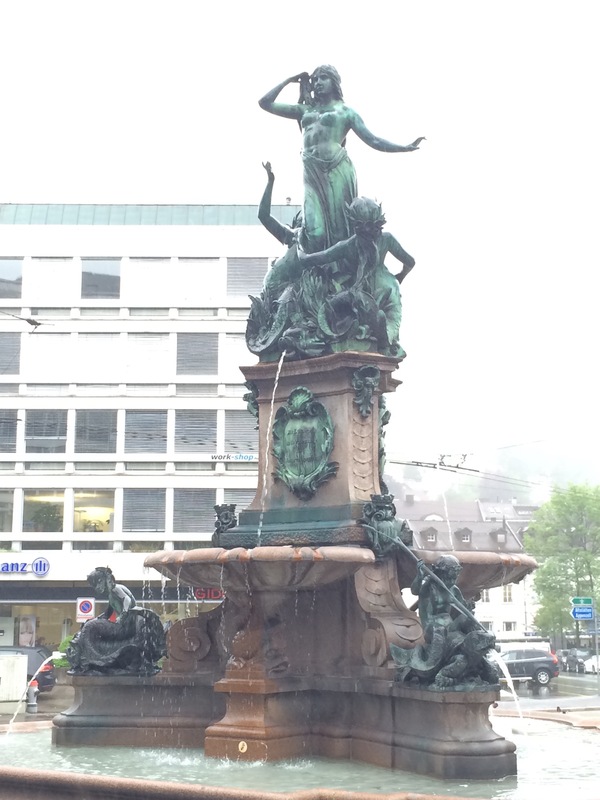 We spent only two half days in St. Gallen and that felt adequate. However, its location and access to the main train line makes it a perfect base camp for exploring the Appenzell region of Switzerland. 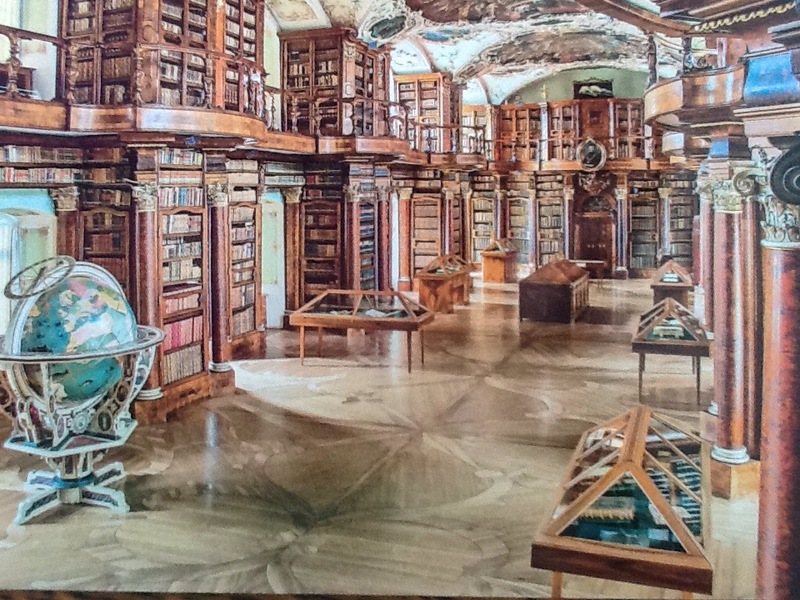 Plus, the Abbey Library is absolutely a must-see. It is routinely listed in the top 5 most beautiful libraries in the world and is in the top 10 most important examples of Carolingian architecture in the world. I am so glad that we went! It will be another week or two before we have another major adventure, but keep checking back for other stories and articles. I have quite a few in the works! The Swiss Family Carlson goes to Liechtenstein!